Over the years, moviegoers have seen the Walt Disney Company influence some of its feature films by basing a handful off some of their popular theme park attractions rides. This has been met with a trial and error process with the heightened success of the four Pirates of the Caribbean movies (with the fifth one being currently filmed) to the less favorable ones like 1997’s TV movie Tower of Terror, 2002’s Country Bears and 2003’s The Haunted Mansion. Seeking inspiration for a slam dunk of a summer movie, Disney turns its gaze inwards once again towards its own theme parks, finding its futuristic muse with their next blockbuster adventure Tomorrowland. Does this sci-fi adventure soar towards future glory or is another meekly featured film of past endeavors? A resourceful young teenager and daughter of a soon-to-be out of a job NASA scientist (Time McGraw), Casey (Britt Robinson) is curious about Earth’s future, but her bubbly optimism has no place in a society that broadcasts a bleak outlook on worldly events. Stumbling upon a mysterious pin by chance that shows her a glimpse of a futuristic utopia called Tomorrowland, Casey wants to learn more about what she saw. Beginning her journey with an Audio-Animatronic named Athena (Raffey Cassidy) as her temporal guide, Casey is brought to the house of cynical recluse named Frank (George Clooney). There she learns that Frank was a former resident of Tomorrowland, kicked out by the society’s appointed leader Governor Nix (Hugh Laurie) after uncovering the community’s secrets. After fending off several Audio-Animatronics’ men, who are in pursuit of Casey and Athena, Frank, whether he wanted to or not, unwillingly pulled into the Casey’s quest, manufacturing a way to Tomorrowland for the trio after sensing that the youthful teenager’s optimism is the key to averting the world’s future from disastrous chaos. Awhile back, I remembered hearing talk of Disney’s creating a live-action movie that was based off of Tomorrowland (one of the worlds found in both the Disneyland theme park and in Disneyworld’s Magic Kingdom theme park) with director Brad Bird attached to it. I then saw the teaser trailer for Tomorrowland back in December 2014 and was sort curious to see what the movie was going to be about. Finally, the theatrical trailer for the movie arrives and I was energized with super hype. After months of hearing about Tomorrowland, the film is finally released and, after viewing it, found it to be a big budgeted Disney adventure movie that has unique attributes to the feature, but muddles itself from reaching its intended cinematic heights of sci-fi glory. Director Brad Bird, who as directed such hits as The Iron Giant, The Incredibles, Ratatouille, and Mission Impossible: Ghost Protocol, take Tomorrowland into his hands, crafting the theme park world of Disney into a imaginative centerpiece place for a feature film is cleverly handled with care. Bird also knows, from past movie endeavors, of hitting the right tone, resulting in a number of humorous scenes that are met with flashy action set pieces, and sprinkles just enough emotional dramatics for those in-between scenes that poignant and relevant to the movie’s story and in real life. The themes and messages that Tomorrowland presents its viewers with is also highly commendable and worth noting. 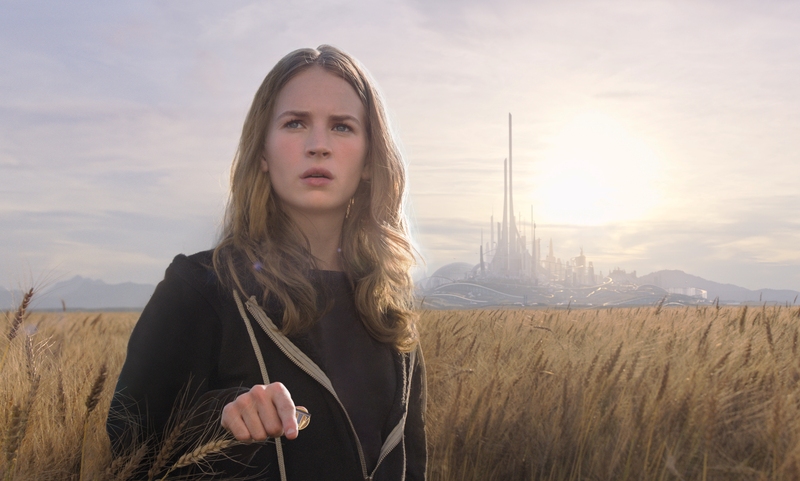 The elements of optimism and hope are the movie’s undertone theme, while the celebrated ideas of imagination and innovation are encouraged, proving to be the paramount keys to Tomorrowland’s futuristic utopia. This are really good messages to promote, especially to the younger generation, with the attempted hope of them expressing a desire to one day help and / or create something that would benefit society’s future. Tomorrowland also touches on an interesting subject matter, on which today’s society (currently) has a strange fixation on apocalyptic / end of the world scenarios. If you really take a step back, we actually do. Dystopian societies, zombie infestation uprisings, and global climate catastrophes are now main stream in pop culture and are depicted heavily in various media facets (books, video games, TV, and movies). I’m not saying whether it’s a good or bad thing, it’s just curiously interesting. Tomorrowland’s script was penned by Brad Bird and Damon Lindelof (famous for writing for the TV show Lost and The Leftovers as well as films like Star Trek: Into Darkness and Prometheus) with additional help from Jeff Jensen. While Bird’s contributions seems to be on the tender and emotional insights around the film’s central core (as well as it comedy), Lindelof part seems more on the mystery intrigue to the narrative. That being said, Lindelof also has a bad reputation for not “landing his own plane” when it comes tying all the narrative threads together in the third act, which he continues to do so in Tomorrowland. There’s far too much build up on getting to the fabled utopia of Tomorrowland in the movie, which causes pacing issues and eats up a good amount of the film’s runtime. When our heroes actually arrive in Tomorrowland, the payoff for it is somewhat deflated. In truth, the film’s greatest failure comes from not delivering a promising third act. Spent in Tomorrowland, the movie’s climax feels hollow and unfulfilled with Illogical motivations, glossed over narrative gaps, and a big villain reveal that feels anticlimactic. It’s really a disappointment as Tomorrowland could’ve been a spectacular film with some storyboard tweaks. Unfortunately, as it stands, its narrative is all bark with an unsatisfying third act bite. From a visual standpoint, Tomorrowland is great with production designs that are quite literally out of this world. Practical effects are handled well for a CG heavy adventure film with advanced technology weapons and modern invention gadgets been promptly showcased throughout the film. The actually look and feel of futuristic Tomorrowland is absolutely breathtaking. Its cool retro vibe of how the future would’ve been imagined back in the 60’s is incredible. The best part that highlights this (and probably the best scene in the movie) is when Casey’s glimpse into Tomorrowland via her mysterious pin, showing her (and us the viewers) all the wondrous flights of fancy that this magical place has to offer. You even see some of the original structural designs that Walt Disney and his team had imagined for the theme parks (I heard there’s several, but I could only see Space Mountain). Overall, the visual cityscape of Tomorrowland is truly a moment to be awed over and I wished there could’ve been more time spent in this utopian world. As a side-note, musical composer Michael Giacchino scores Tomorrowland with beautiful melodies that have a flourishing sense of adventurous discovery. The three main cast members in Tomorrowland are fantastic and have a strong rapport with each other. Britt Robinson’s Casey, the film’s central heroine, is very likable with her plucky charm and intelligent resourcefulness. She handles herself well on-screen and makes it easy for viewer’s buy into her classic persona of being the hero / savior / chosen one for Tomorrowland. Seasoned veteran actor George Clooney most mostly artsy or academy award winning films, so it’s a bit of a surprise (and a little bit refreshing) to see 54 year old actor participate in a blockbuster type movie. 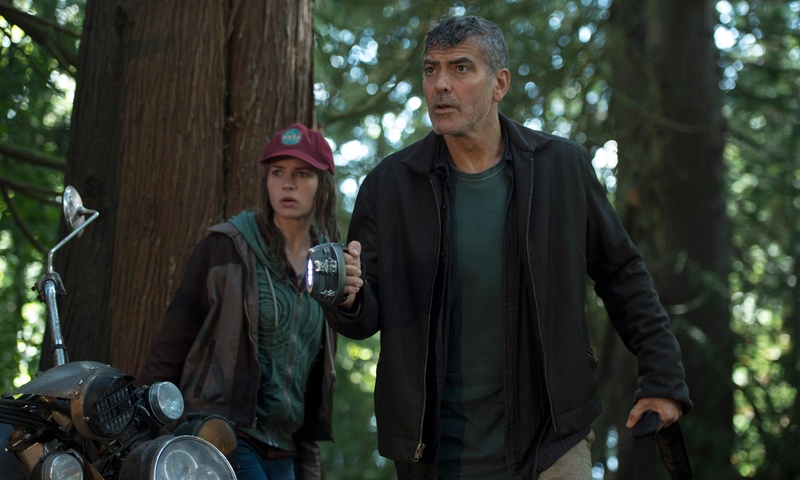 With being said, Clooney seems to be having fun in the picture as the grouchy exiled-Tomorrowland citizen Frank, whose dusty cynical mind of gets a much-need recharged by encountering Casey and her eternal optimism. 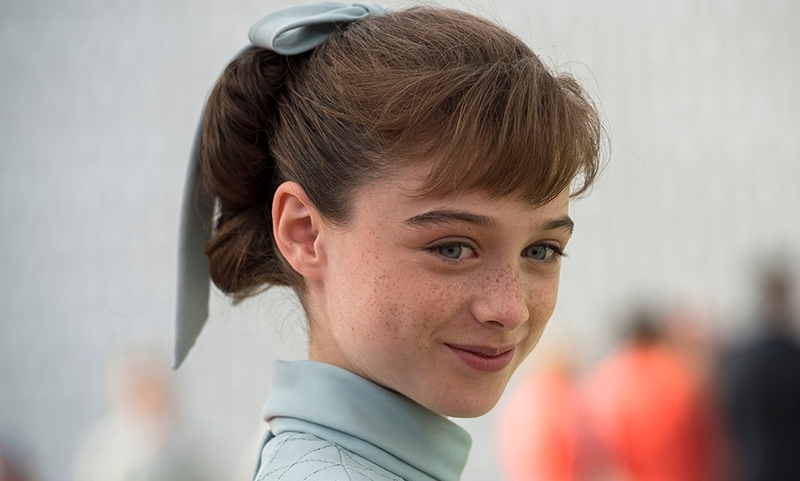 However, the biggest surprise of the film’s central trio comes from the last member Raffey Cassidy, the thirteen year old actress who plays Audio-Animatronic Athena. Cassidy actually does a tremendous job as the calm and collected demeanor of a robot, resulting in a performance that’s fantastic, even when she share the screen with a such prolific actor like Clooney. 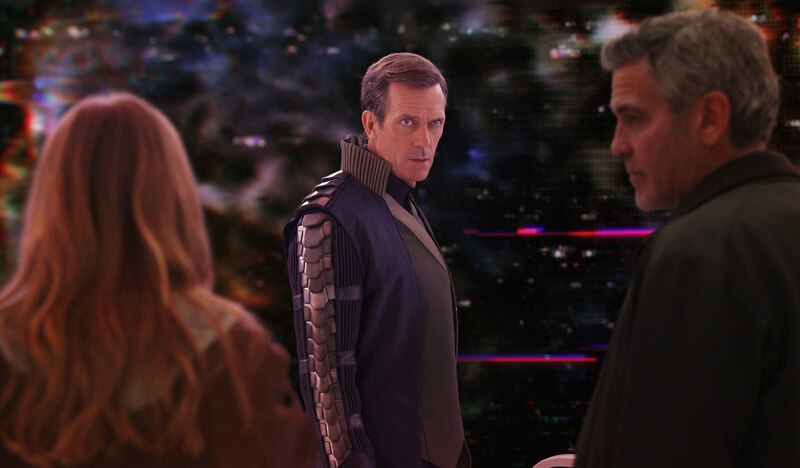 As for minor supporting characters, British actor Hugh Laurie plays Tomorrowland’s cold-hearted leader, Governor Nix. It’s really shame that Brad Bird and Damon Lindelof didn’t utilizes Laurie acting potential as his character / villain of the feature is generally flat, weak, and somewhat forgettable. Next, Keegan-Michael Key and Kathryn Hahn bring a fun and quirky comedy relief in Hugo and Ursula as the sci-fi pawn shop owners of “Blast from the Past”. The final minor character worth noting is singer / actor Tim McGraw as Casey’s scientist dad. Though his part is relatively small, McGraw get the job done, channeling the classic dad personality we’ve seeing over the years in films and TV (which fits him perfectly). Additionally, Thomas Robinson, who plays the younger version of Frank, does an admirable job. Lastly, I saw Tomorrowland in IMAX. Was it worth it? Iffy, I say. Sure it bolsters the crystal clear imagery on-screen and bombards your ears with its heightened sound, but Tomorrowland was just okay in IMAX. There are a couple of stand-out sequences (Casey’s introduction trip to Tomorrowland via the pin and the assault on Frank’s house), so it’s pretty much up to a viewer on how much they want to spend on movie ticket to see Tomorrowland. If you’re flushed with cash, go see it in IMAX and if your tight with money, go see it in 2D (It’s not one of those essential movies you need to see in IMAX). 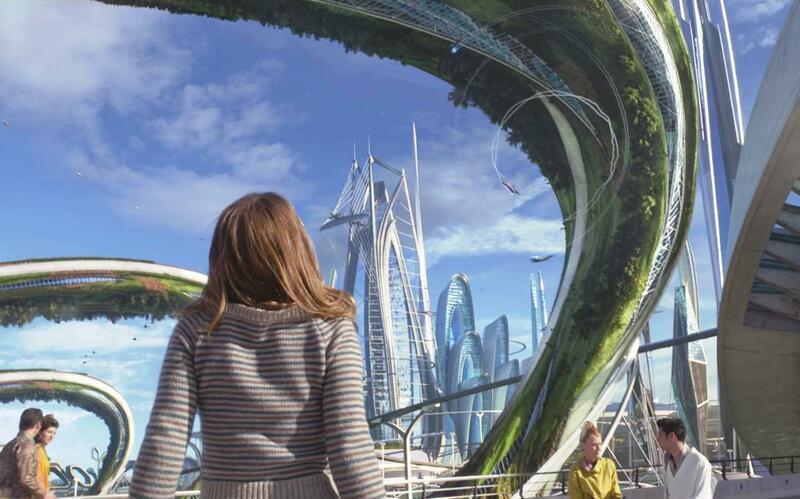 Imagination, innovation, and the optimism to dream are the core fundamental element that are expressed in Disney’s Tomorrowland. Director Brad Bird’s blockbuster has the right ingredients of summer movie, but lacks the proper mixture to create a wholesome story; pacing issues, inconclusive big ideas, and a lackluster third act are the main culprits. Despite the cons, the movie is imaginatively designed with its retro-futuristic aesthetics vibe, nifty sci-fi action scenes, thematic messages, and strong performances from its cast. It’s a movie meant for all ages, inspiring the young to thinking and create for the future (which is always a good thing). All in all, Tomorrowland is a compelling and fun ride in visual escapism. It’s definitely worth checking out and worthy of being a called a summer blockbuster movie. It’s just a shame that it isn’t the summer blockbuster movie it wanted to be.